Hello to DK and all the Island Time Radio listeners! Coincidental visor night at the Lion! TikiTender live on Island Time Radio Tonight! Just a reminder that I will be a call in guest to the Ohio-based Island Time Radio show tonight. Catch me live between 11:00pm and 11:30 pm at wbwc.com, or listen to replays later in the week at the times listed below. Repost: It's weekend time again! From the Golden Lion Blog "Zeus News"
It's a margarita weekend at the Golden Lion! $4.50 House Margaritas Friday & Saturday Night! Think that's a good deal? Come back on Monday for Margarita Madness. Every Monday night we offer $3.50 house 'ritas, $2.50 Coronas & Tecates, and $6.50 quesadillas, fish tacos, and Sharon's nachos! Golden Lion Wins 11 Best Around Awards! Thanks to all who voted in the Daytona Beach News-Journal's Best Around Awards. We won 11 awards this year. If not mistaken, I believe this gives us over 100 awards since 1992! We should win best customers! The Lion is the place to be on Labor Day weekend! Live music all weekend from the likes of Zebbhi Niyah, Rattleshake, Ken McLanis, & Joe Atti. On Saturday, September 5th, we will throw our nearly world famous Full Moon Luau Style Party. Tiki Torches, Tropical Drink, Limbo Contests! Grass Skirts? Tropical Attire Encouraged. Feeling like something new from the bar? 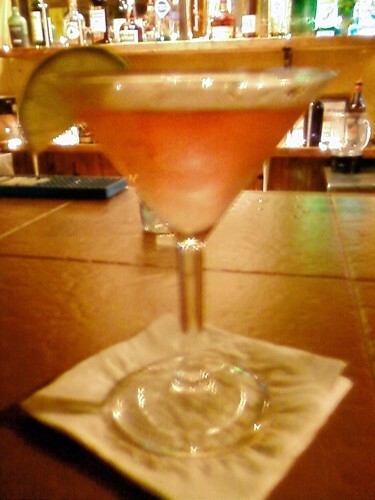 Try a Mexican Cosmo with Agavero. Agavero is an ultra-premium spirit that is created from a blend of 100% blue agave añejo and reposado tequilas hand blended with the essence of Damiana flower for unparalleled smoothness and taste. Get loud, laugh with friends, dance in the sand. It's okay, we like it! Proud Of My First Grader! She has her new back to school outfit on & lunch in hand. All of her paperwork is in order. Marley & I both woke up earlier than we wanted to, just to see her off. Her classroom looked awesome at Meet The Teacher Day on Friday (she must have a great volunteer!). Ahhh, the sweet sound of quiet around the house. The pleasure of having my weekdays to get stuff done! The sweet joy of a lower electric bill LOL (I just went around turning off all the lights). Three Cheers for Mrs. Tiki! It's going to be a great year! In a large glass, crush the cherry and lime wedge with a muddler. Fill with ice and add remaining ingredients. Enjoy! Try one tonight at the Golden Lion! The archive of last Saturday's Chamber Chat has been posted at the site below. Listen in to 3 social media gurus (including me) discussing social media and business. Special thanks to Ky & Lisa for rounding out the panel and Gretchen from the Flagler County Chamber for hosting! Two Movies That I Can't Wait To See! Mrs. Tiki and I went to see Funny People Saturday night. Funny People is Judd Apatow's (40 Year Old Virgin, Knocked Up) latest bromance starring Adam Sandler & Seth Rogen. This isn'[t intended as a review of Funny People, but I will say this. It's funny, with serious relationship undertones, then funny again. On to the two movies I can't wait to see (both featured as trailers during Funny People). This is a Jon Favreau written, Peter Billingsley directed ensemble comedy starring Vince Vaughn. What more do I need to say? Yes, THE Peter Billingsley (Ralphie from A Christmas Story). You might have noticed him in The Break Up, alongside Vaughn, Favreau, & Jason Bateman. Throw in Kristin Bell, Kristin Davis and the hot but psycho wife from The Heartbreak Kid for the cheesecake and you have a good start. Kristin Bell, by the way, is wicked funny also. The premise is four married couples at a tropical island retreat (Hmmm sound like a Jenna Jameson plot), "Problem Island" as Vaughn's charachter describes it. The hilarity ensues. Watch the trailer at joblo.com. First off, this movie has maybe the coolest website ever. I have been peeping at it for months now. www.d-9.com Get ready to experience a multi-layer website that will blow you away. For the movie, it is an epic Peter Jackson (The Lord Of The Rings) adventure about aliens segregated into District 9. I am thinking I will need to go alone or with another Sci-Fi fan because it is not Mrs. Tiki's style. So get your applications in now to watch it with me! Opens August 14th! Help My Friend Steve Fight Multiple Sclerosis!!!! Well, it is that time of year again...the Kansas City MS 150 is on September 26-27. As most of you know, this will be my third year riding in the MS 150. The last two years of biking have been great for me and a great opportunity for you to help me pass on a few blessings to those less fortunate. I need your help again!! I was reminded why I do this during a ride earlier this year. I was about 50 miles into a 65 mile organized ride in June. It was extremely hot, the hills were steep, and the cramps in my legs were so bad I had to walk - which I could barely do - up a hill at one point. As I walked the cramps off I thought of those with MS and how they don't have the opportunity to just "walk it off" like I did. So, I quit my whining, got on my bike, finished the ride, and vowed to do all I could again this year to help those struggling with this debilitating disease. I've been on several training rides since that late June ride, however, I still need you to help me finish preparing for the 150. First of all, I need your thoughts and prayers...they do work because I've survived two previous 150+ mile bike rides:)). Secondly, I need your donations. It's the dollars I raise, not the cramps I endure, that really make a difference. Please consider helping me again this year. The simplest way is by clicking on the link below where you will be taken directly to my MS 150 web page where you can make a donation. Thank you in advance for your donations, thoughts, and prayers as I prepare for my third MS 150 ride. I will let everyone know how it goes. "Prepared on the fly one Saturday night for a new customer who liked my "Tiki Kooler", but wanted something sweeter. About half way through this drink she began giggling uncontrollably, much to the amusement of her husband and me." Beat the summer heat with this sweet sipper. Fill a tall glass with ice. Add all ingredients, balancing with cranberry juice. Squeeze in the juice from one lime wedge. Enjoy! Pour all ingredients into a shaker half filled with ice. Shake vigorously and pour into your favorite glass. Repeat until it stops raining. "Women like three things: Men in kilts, Southern Comfort, and Chris Isaak's 'Wicked Game'." First time I ever watched the show, those dudes are wise like Buddha! "Created for my parrothead friend, Traceface."